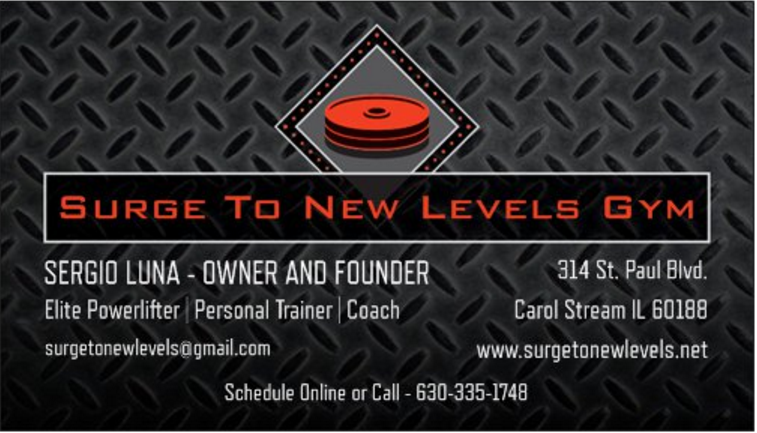 Please email, call, or text to redeem offers and schedule appointments in regards to membership, guest passes, personal training, coaching, or any of our classes. ​​"Sergio provides an excellent level of service. Every workout has been custom-tailored to meet my needs.. He continues to find the right balance of pushing me to, but not past, my limits. While he clearly knows about and has had great success in the powerlifting world, he is very approachable for a casual fitness enthusiast like myself. He definitely delivers on his promise to make you stronger with his unique approach. He handles his business with great integrity and shares his expertise with ease for all levels. Don't miss out on the opportunity to work out in a space that takes away all the pressures of working out with a trainer who builds you up every step of the way."